J John is an internationally recognised Christian speaker and author. He has written over 50 books and spoken in 69 countries, teaching the Christian faith and addressing over 300,000 people in person each year. His series Just 10 (on the Ten Commandments) has now exceeded one million people in attendance. You can find out more about J John and his work through his Philo Trust website and also follow him on Twitter. What do you think of when I mention Vincent Van Gogh? 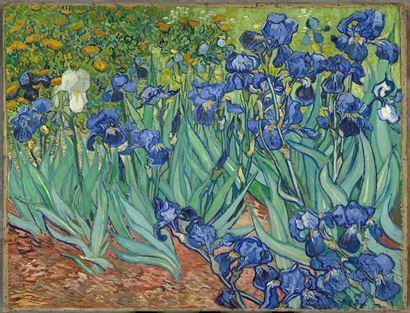 Until recently, what I knew about Van Gogh was limited to four things: only one of his paintings had sold during his lifetime; he cut off his ear; Don McLean recorded a tribute to him, ‘Vincent’, in the 1970s, which began, ‘Starry, starry night’; and a museum (the Getty) had purchased his painting ‘Irises’ for millions of pounds. I wondered how such an ordinary painting could sell for such an outrageous price. What did the songwriter understand that I didn’t? He also wrote about these poor people, that he ‘should be very happy if someday I could draw them, so that those unknown would be brought before the eyes of the people.’ And he preached on Sundays, trying the best he could to infuse a little hope and a little encouragement into their coal-dark lives and attempting also to tell the story of Jesus by drawing. However, because Vincent was unwilling to follow the guidelines set before him, the governing body overseeing his ministry terminated his position. Angered and embittered, Vincent left and in 1880, at 27 years of age, he embarked on what was to become his journey as an artist. But no one seemed to understand what this impassioned artist was trying to say. Through years of rejection, loneliness and depression, Vincent’s mental state deteriorated. On 8 May 1889 he was admitted to an asylum in France. He was shown to his room by a nun, who asked, ‘Would you like me to open the windows?’ Vincent nodded. When she opened them, he looked out on the countryside with its sun-washed fields and he painted what he saw. He signed it in the lower right hand corner, ‘Vincent’, and titled it ‘Irises’. Vincent was able, ultimately, to ‘preach’ through his art. God is the source of all human talents and the value placed upon ‘Irises’ is a measure of the esteem in which Van Gogh is now held as an artist. Creativity has been built into every one of us: it is part of our design. Each of us lives less of the life God intended for us when we choose not to live out the creative gifts God gave us. ‹ How can anyone make sense of Christianity if Christians don’t know what they believe? Yes, I can agree with that for it explains why we have so many different gods, yet only the Aztec’s is real – our Sun.